How wide should my jacket lapels be? A reader asked this a few weeks ago now, and I thought I’d illustrate my answer by showing the widths that five tailors have cut for my body and proportions. As you can see from the images below, some lapels are wider than others, but they are all within a range. No one is as skinny as most ready-to-wear suits out there today, and no one is 1980s super-wide. Tailors usually stick within moderate limits because they know that a lapel looks more classic, subtle and harmonious when it is proportionate to the rest of the suit – it is balanced somewhere around halfway across the width of the chest. The width of tailors’ lapels has changed markedly over the decades. It’s probably the key indicator of period when it comes to suits, closely followed by trouser width. But they always tend to move less than ready-made fashions. Of course, there are much broader bespoke lapels than those shown here. 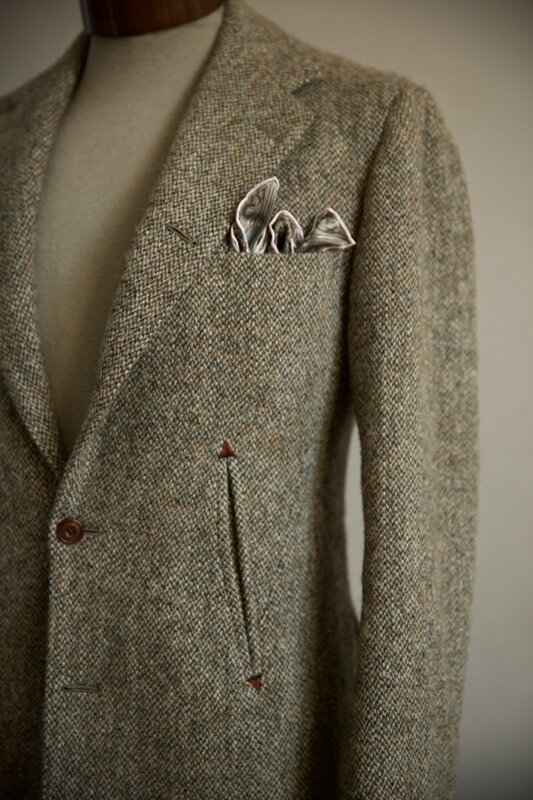 I haven’t used my Chittleborough & Morgan jacket, for instance, which has 11.5cm lapels. And other tailors like Sciamat are also deliberately wider. But there’s the rub – the lapels are deliberately wide as a point of fashion, or design. There are precious few things you can do with the line of a classic suit to make it stand out from the crowd, but changing the lapel width is definitely one of them. So when you’re deciding how wide you want your lapels to be on a bespoke suit, bear this in mind. If you want it to be more unusual (and potentially be less versatile, and riskier in terms of going out of style) then go slimmer or wider, but if you want a classic, stay within the boundaries of what’s on display here (bearing in mind that this is for a 39-inch chest – bigger sizes would have bigger lapels). Within the range of these tailors, I probably prefer a slightly wider lapel today – around 10cm. It has a little more drama than 9cm and is further away from the horrific skinny lapels on the high street. The Huntsman is too narrow at 8.5cm. However, because they are all within a fairly conservative range, there are none that I just wouldn’t wear any more. It doesn’t bother me that much that the Huntsman is narrower (it bothers me that this is what they consider a casual jacket, but that’s another story). And I never notice that the Anderson & Sheppard is a touch narrower than the Europeans. You can follow the discussion on How wide should my jacket lapels be? by entering your email address in the box below. You will then receive an email every time a new comment is added. These will also contain a link to a page where you can stop the alerts, and remove all of your related data from the site. Thanks Simon, on a slightly different tack. I notice that the roping at the sleeve head on the Cifonelli jacket has all but disappeared leaving a very natural looking shoulder. This is something I prefer but am interested to know if the photograph is showing it incorrectly or the sleeve head just relaxes over time. The reason I ask this is my (first) bespoke savile row odd jacket has a more pronounced roping than I would have liked and really hope it will relax over time. It shouldn’t change over time, no. 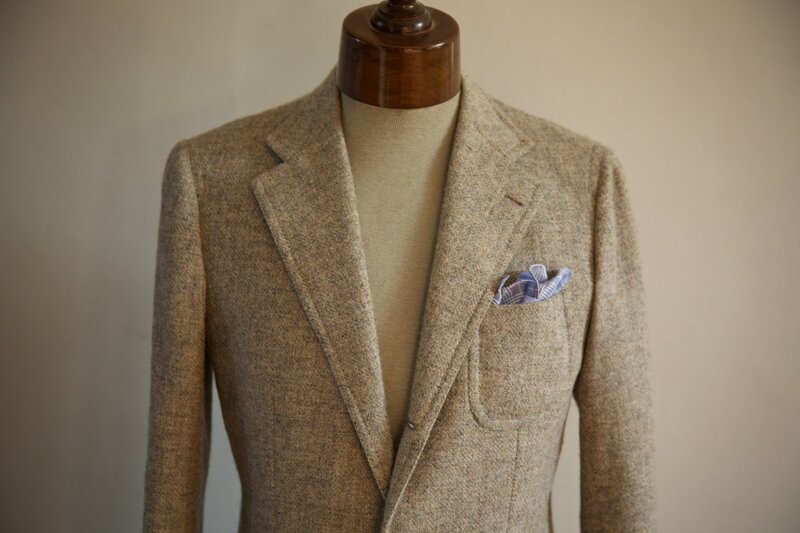 The Cifonelli jacket doesn’t have any roping – in fact, it is set under the shoulder like a ‘spalla camicia’. I requested this change as I wanted the the jacket to be more casual, and Lorenzo is one of the few people that I’ve seen do both well. Going back to your previous post on body shapes -v- cut, do you think that width of lapels should be a consideration for those carry an extra few pounds around the middle? I hope someone shows this to Jeremy Corbyn. I’m afraid I don’t understand the logic of how the width of a lapel would not be proportionate to the chest width. It’s all a matter of balance–broader chest/broader lapels and vice versa. The problem with very broad/very skinny is that the lapels don’t look right on anyone. Simon…don’t we need to consider how wide the person’s shoulders are…for example if someone is smaller built than you with narrower shoulders, I would imagine you should use more like 8cm lapels…as long as you have another 8-9cm from the lapel edge to the shoulder. I guess the main thing is the roughly “halfway” rule to keep in mind. Again an interesting take on an important detail. For me fashion is not the guide, but rather the lapels should in proportion to the width of the chest, the broader the chest the wider the lapels and vice versa. I know it is not very fashion but it ensures a harmonious look that lasts. I would be very interested to get your views on lapels for double breasted jackets, which I find far more tricky as there are so many more variations, the gorge, the angle of the peak, the width of the peaked part compared to the rest of the lapel, the height of the peaks. 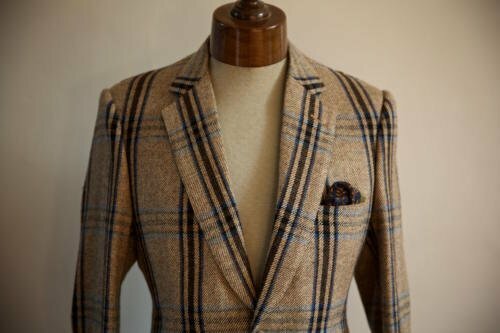 Slightly off topic but what are your thoughts on the alignment of checks and windowpanes on sports jackets? I really like the width of the lapels on the Huntsman jacket. They have a little belly, which gives them a slightly wider impression. Agreed. Apart from the slightly ‘busy’ pattern of the cloth, the lapels and overall proportions are the most pleasing to the eye of all five. I can see Simon’s point about it being strange for a casual jacket, but, again, I think that is down to the pattern of the cloth: in a nice grey or oatmeal Donegal it would be wonderful. I actually meant it’s entirely the construction, rather than the pattern or colour. Tailors like Huntsman offer a structured, square-shouldered, long jacket with a tall collar and tell customers it’s for the weekend. It only works with formal trousers and with a shirt and tie. How many people wear that at the weekend? This is a very interesting point Simon. As a former customer of Huntsman I have had similar thoughts, the jacket doesn’t really work with Chinos or Jeans or even Cords unless of course you have them bespoke cut in a formal style. It looks wrong as the jacket is long, lean and has padding to give it an armour like look. IMO any regular trouser, by which I mean sitting lower than the natural waist on a belt, doesn’t look right with a one button jacket as the skirt peels away to reveal a huge expanse between the trouser top and the jacket button. Therefore you have to get a high waisted trouser cut too with the jacket. The thing is that the Huntsman cut is the closest jacket style I think to something from a former era such as tails or riding coat. Therefore it was created to be worn with formal trouser. That ‘equestrian’ style jacket is now out of sync with any type of other modern trouser and it shows when you try to wear the two. I’ve worn a Huntsman sports jacket with chinos but the trouser then stands out and looks tatty as they lack the shape to fit in with such a structured garment, so I’ve taken to only wearing flannels even when going to a casual party, coffee shop etc and you look frankly a little overdressed in some places. I don’t know what a Huntsman can do about it though? Its not like they can say “we have a casual cut jacket as well” which could be more similar to a middle of the road WE jacket such as Pooles for instance. I guess the customer has to shop at another tailor for casual wear or just buy a casual jacket off the rack from the Italian places or similar. The moral is if you go Huntsman you have to go the full Huntsman. Anderson&Sheppard’s haberdashery has a model of RTW high rise trousers that goes fairly well with my structured sports jacket. 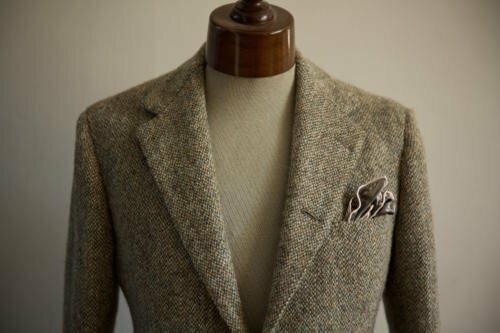 True, any bespoke jacket from SR will need a pair of bespoke trousers too, even their sports jackets. C&M has a narrower model of trousers for that purpose (still high rise, but lower, jodhpur pockets, no pleats). I wear that combination with a roll neck or polo shirt in the weekends for a walk to the museum, a coffee with friends,… Yes, it’s still a little dressed up, but the roll neck/polo shirt dresses it down a lot. Of course I wouldn’t go to a rock concert or beach that way, but then I wouldn’t wear bespoke on those occasions anyway. After all, casual can mean a lot of things too. ‘A little dressed up’ is pretty much where I see most readers of this blog as being. Isn’t that why we are here; because we prefer that to the not-dressed-up-at-all look favoured by most of our fellow citizens. I’ve realised – and, to be fair, I am 56 – that one can either dress solely for comfort like most, but then, frankly, you might as well wear pyjamas all the time or dress for yourself. The best version of yourself. Cheers for the tips! The trousers are expensive for RTW at A&S haberdashery though. you could get a pair of MTM trousers made up for the same sort of money by several good WE Tailors. On CM narrow trouser, is that a house bespoke style of trouser for their sports coats I assume and not a RTW trouser they produce? True, A&S rtw trousers are not cheap. But after I had tried them on, I had no doubts. They really have given their different trouser styles some thoughts, e.g. coin pockets etc. True, other tailors or mtm may be cheaper. I used Graham Browne, but then every pair (out of 6!) turned out to be different. C&M only makes bespoke. It’s the other extreme. They really put a lot of handwork in their trousers. Most of the SR houses use a tailor Chris in Soho for the sewing and finishing of their trousers, but C&M control that part of the process much more themselves and also chose more expensive solutions, e.g. the shaping of each trouser leg, more hand sewing etc. As a result their trousers are more expensive. Yes, they suggest the narrower, sporty trousers for weekends. In the interview with Michael Browne elsewhere on this site he describes the style, if I remember right. Thanks for this. Would the 9 – 10cm range change at all for guys on the smaller end of the spectrum (34/36 size chest)? Also how does lapel width play into gorge and height of the lapel itself? Indeed, this post is about a huge important area worth considering for PS readers. Since it touchs on the V shape, as Drake once put it. As you’ve already mentioned in previous replies one’s body shape is to be factored in when deciding what to do exactly when it comes to said area. Personally, I witness an undergoing pervasive trend towards wide lapels i. high end tailoring,. But to be honest, I really do not think it properly fits everyone. Anyway, I don’t feel at ease at all with this choice. Feeling good with what one wears is absolutely important.This is why the value of bespoke is unquestionable. Now, deciding the look of this area seems – to me – to have far reaching consequences perhaps worth exploring in another post as to the choice of the number of buttons in a SB jacket, wearing a crewneck, rollneck or cardigan, for instance, since each item differently affects the look of the V shape. Great post, Simon, once again! I loved seeing all these different jackets from structured to unstructed on the forms to compare them all to one another. Quick question: do you find yourself wearing more jackets then suits these days or do you equally wear both? 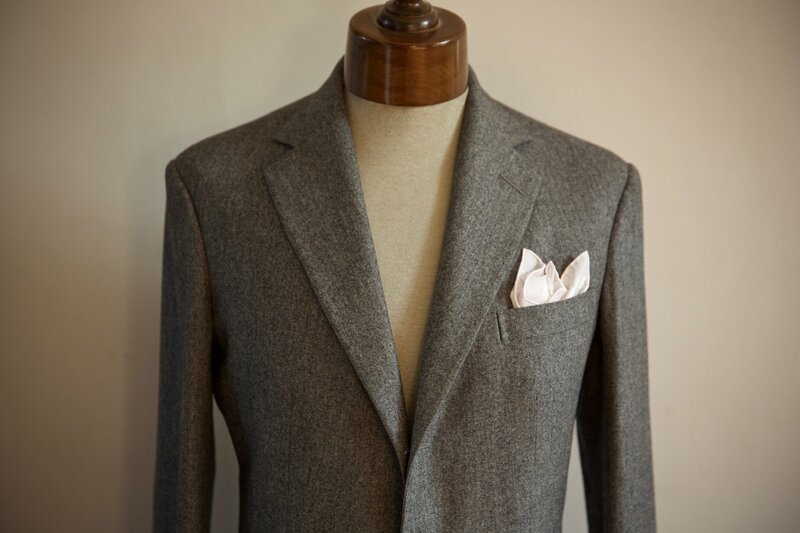 The lapels look to be a tad wider than 9-10cm or closer to 60% across, but it still looks proportional. I’ve often wondered about that jacket after seeing it, do you get much wear out of it? I do yes, though I have quite a lot of grey jackets. They are 10cm too.. I do favour a good lapel. One of the many things I despise about those ‘Pee Wee Herman’ suits is the complete absence of a decent man size adornment .How ridiculous Craig looks as Bond in those ill fitting Thome Brown influenced things. Bring back Jason King I say – now there’s a man who knew a thing or two about lapels! I’m surprised that this great review of lapels leaves out the master of the outre – Chittelborough & Morgan ? Yes but no photo of these magnificent beasts! Simon,what about double breasted lapels size? For exemple which is the size of an Anderson & Sheppard double breasted,compared with Henry Poole,Liverano,Caliendo and Cifonelli? The double breasted lapels size is a very interesting matter. Also worth mentioning the notch and it’s size and placement. The A & S seems higher set and the Liverano more pronounced (Cifonelli the least notch). One would have to see them worn to gauge best fit – do you have a favourite Simon? Is it only my imagination or is the pattern stripe of the lhs sleeve of the Huntsman set slightly lower (top stripe seems 1cm lower than the rhs – it may be that the pattern is more rotated on the sleeve? )…also was it part of the design that the stripes don’t fully match on lower and upper lapels (not criticising but checks and stripes always belie construction)? Simon, can’t resist asking about the Cifonelli Harris Tweed jacket. I find the pocket detail very intriguing, designed, I would imagine, for cold days and keeping the hands warm. What is it like in the wearing…also love the hank, could you give some detail please? 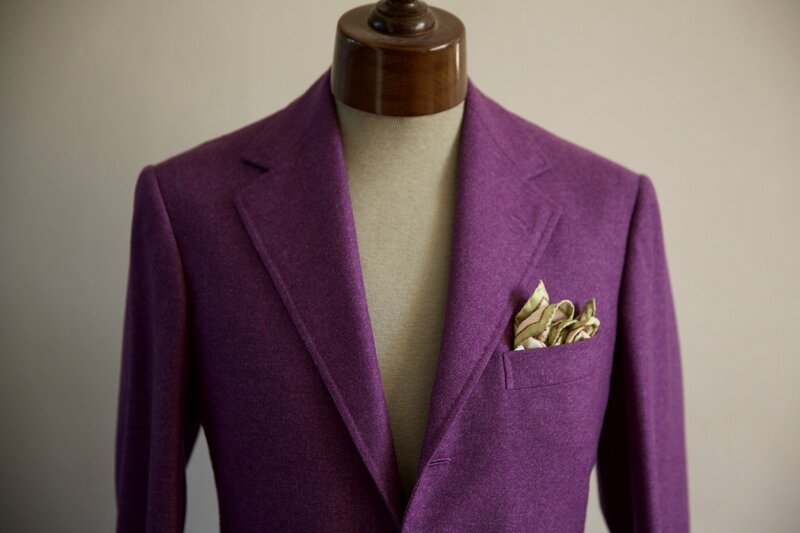 Separately the Liverano jacket is a fantastic colour – I’d like you know what colours you wear it with. Thank you. Thanks for the links Simon – the Liverano article answers my question. I did in fact have a look at the Cifonelli article before asking – I was just really wondering about the experience of wearing along with using the different form of pockets. Thanks again. My husband has a recurrent problem with his suits which he makes and orders from China. The measurements he takes seem to be correct and accurate but the sleeves of his suits always come out wrong. They are not too tight or too baggy; they simply do not hang well on him showing quite a lot of strain lines at the front. Are there any parameters that could be checked during taking measurements or any existing patterns/correlations (between somebody’s measurements or suit’s parts like armholes, shoulders width, chest size, arms size, sleeve itself) that shall be taken into account or checked well before the suit is made in order to avoid this problem? Does the posture or shoulder’s type matter? Thank you very very much for your answer/ precious advice/suggestions in advance! I would really like to understand better the nature of this issue. Must lapel width be specified when doing the original order with the tailor, or can it be adjusted at the basted fitting? Excellent article! I was wondering if the lapel width measurements you are referring to are measured along the diagonal seam between the collar and the lapel? Or, is it rather taken in a straight line perpendicular to the lapel end? Excuse another basic question but where and from which points exactly are you measuring the chest width for the proportional lapel to be half way across? Thank you. Simon, what are the differences between straight and bellied lapels? Which do you prefer, and why? A lapel with belly curves outwards as it runs upwards from the button to the shoulder. Is it possible to say one is more traditional or old-fashioned than the other, or more Italianate? And how do you feel about lapels that seem to curve outward, like I’ve seen on some Eidos jackets? Are lapel widths something you can adjust during suit fittings, or do you have to decide on them from the onset? You can certainly change them at the first (basted) fitting, but from them onwards they are likely to be set. I would make the observeration that the Huntsman jacket has allowed the check to dictate the shape and proportions of the lapel and whichever way you look at a jacket in this cloth it is an absolutely superb piece of work. Hi Simon, I was at WW. Chan and they recommended 10cm lapels (I am relatively small statured but have a relatively large head so perhaps its done for proportion purposes). The trouble is that I have never been a fan of wide ties (I had my wider ties narrowed down to 8cm)…would a 10 cm lapel with a 8 cm tie look disproportionate?